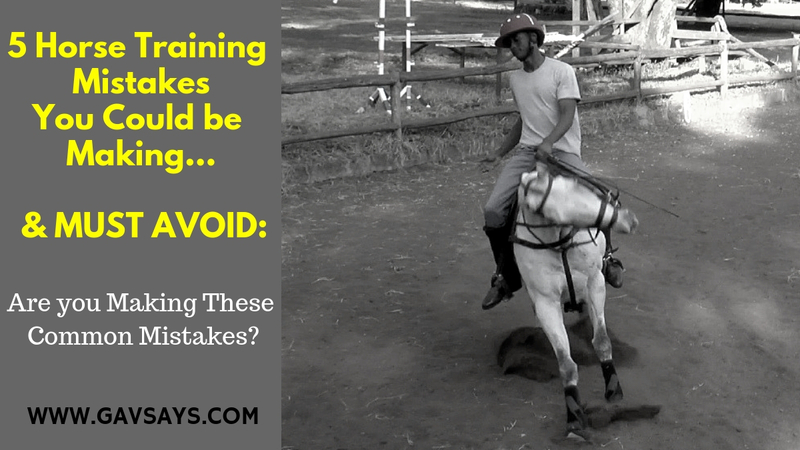 "Am I making these 5 Horse Training Mistakes?" Let's be honest. There's a good chance that you are making at least 1 (or some) of these mistakes. And you definitely want to avoid them. I see so many different people making all 5 of these major mistakes in their training methods. Could you also be falling into these traps? And then I'll give you some top pointers on how to avoid and fix these common mistakes. 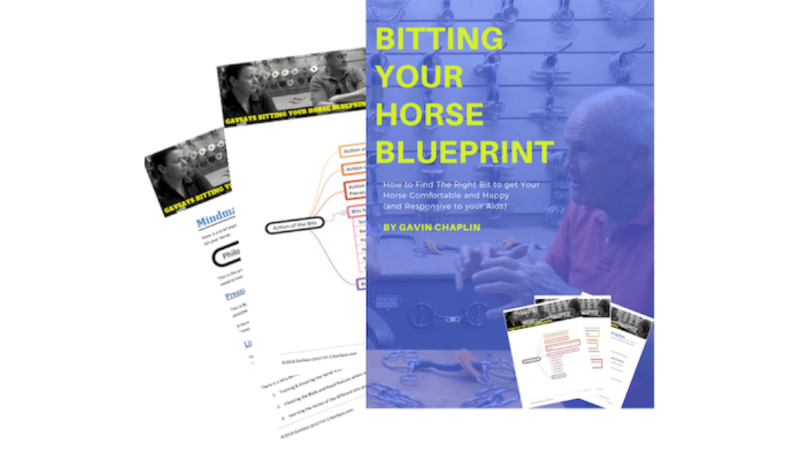 Which will help you clarify your thinking as you approach the exciting challenge of training your horse. Yeah, but it's game changing. 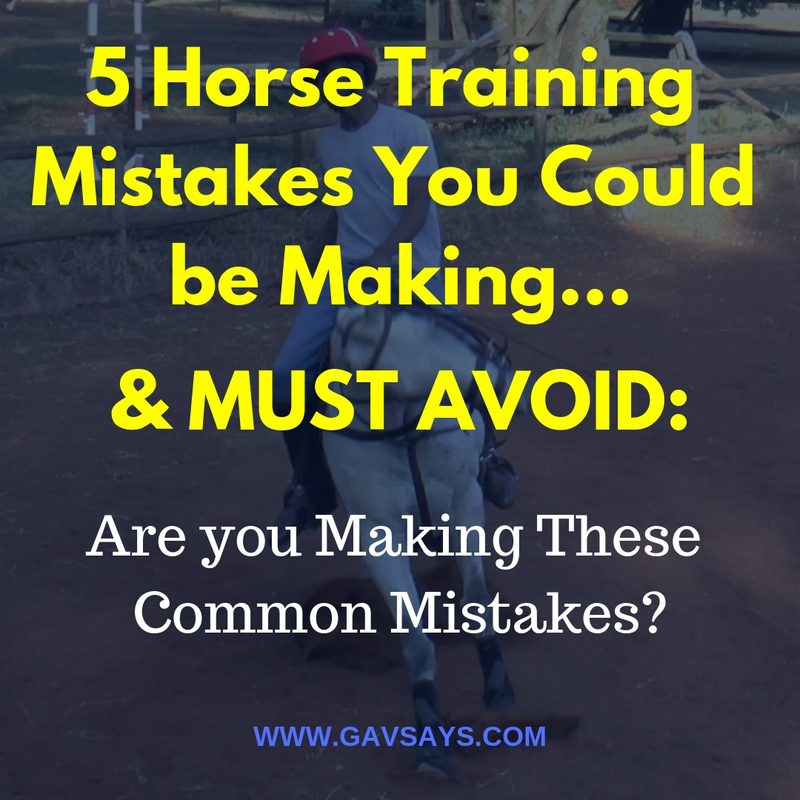 The MOST important mistake that every horse rider and trainer MUST avoid, is not a mistake made whilst training your horse. The BIGGEST mistake people make, is not training and educating themselves. Continually. To be a better rider. To be a better trainer. Because you're here. Reading this page. And educating yourself to be a better rider and horse trainer. But, please do make sure that you are always working on making yourself a better rider. The better you are. The faster your horse will learn. And the better your horse will perform. Simple. 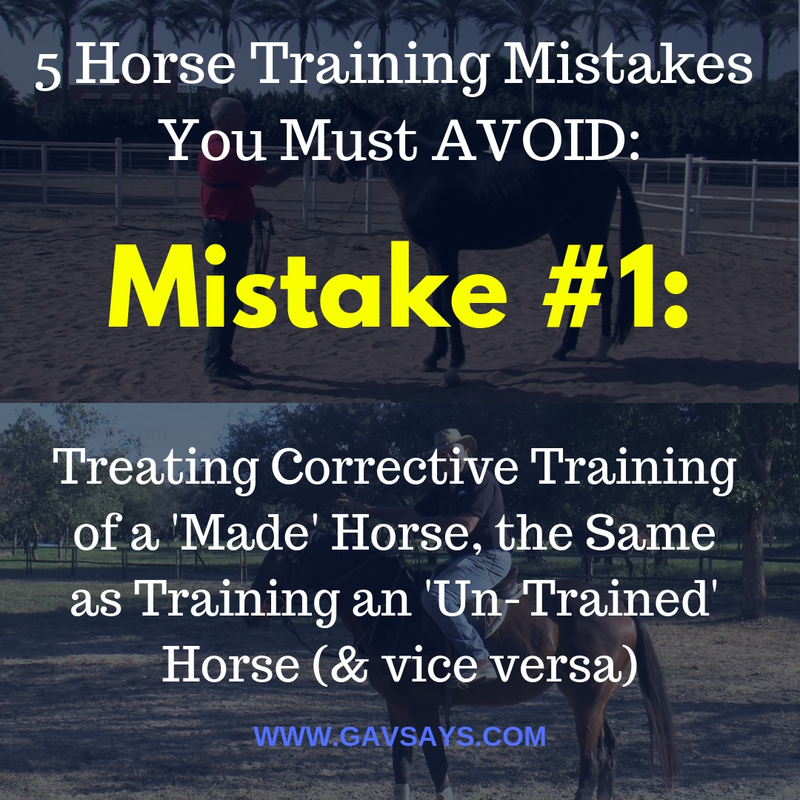 "Treating Corrective Training of a 'Made' Horse, the Same as Training an 'Un-Trained' Horse (and Vice Versa)"
The first mistake I see so many people make, is taking the same approach, and using the same methods -- regardless of whether they are training a young horse, or rehabilitating a made horse that has developed bad habits. These are not the same "kettle of fish", as the saying goes. And you need to approach each slightly differently. With this in mind I thought it would be helpful to discuss the two separately, and highlight the mistakes that I see being made so often in both cases. Because when you really think about it, all horses need constant monitoring and correcting. Just as, for example, a golf professional will be constantly getting advice from his coach to iron out the little mistakes that creep insidiously into his game while he is competing. Horses are just the same for one major reason. When you are competing, winning is the major objective, and one is often overlooking the little mistakes the horse is making in that effort to win. So it takes number 2 spot on the priority list, and winning is the main objective. In the schooling arena the whole focus is on the horse to iron out those mistakes, so that you are more competitive next time out, because the horse is not making those little mistakes any more. This is exactly the same in the analogy I have drawn with a golf professional who will spend hours on the driving range working with his coach to rectify a specific problem, when there is no pressure to win a tournament. What I am going to do is to keep the numbering sequential. This way we can look at the mistakes in an orderly fashion. 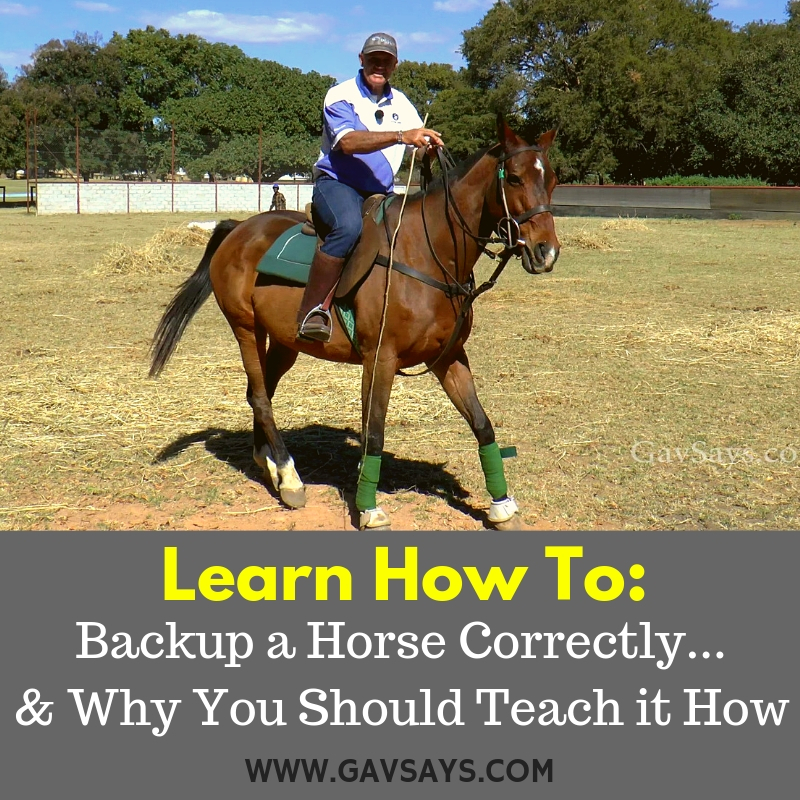 Making it easier for you to memorize and keep them clear in your thoughts..
"You Don't Go Back to the Basics First"
The biggest mistake I see when people approach a horse with problems is to try to implement advanced schooling techniques to rectify the problem, because in their mind they are riding a trained horse. 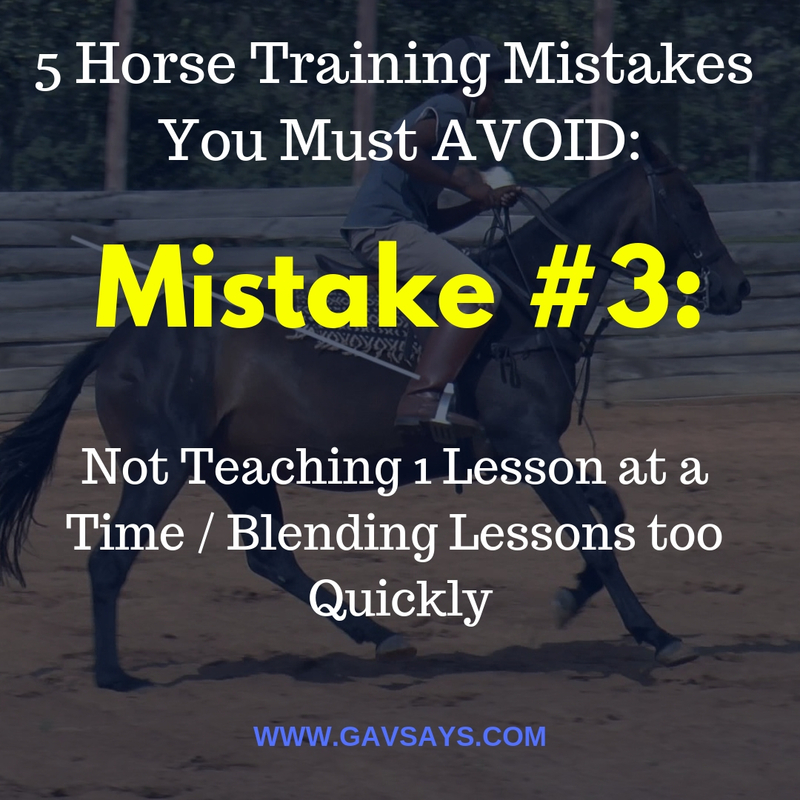 When most often it is a basic lesson that the horse needs reminding of, that is effecting it's advanced maneuvers. You will usually find that it does not know how, or has forgotten how, to perform one of the basic maneuvers it was taught while it was being trained as a young horse. It might also be that it is a horse bought from another stable, and perhaps that basic maneuver was never taught. This so often presents you with a problem when asking it to do the more advanced moves. 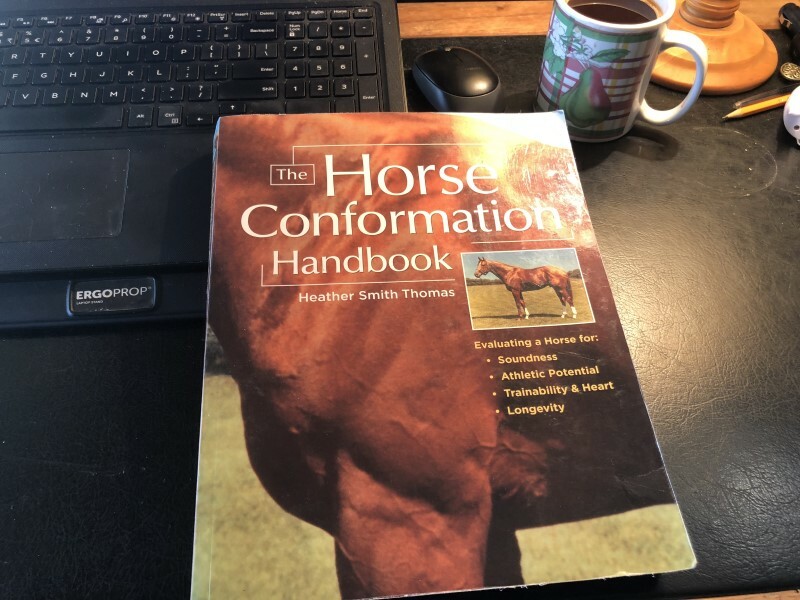 Is to go right back to the beginning and take the horse systematically through all the simple, basic steps one would teach the horse, if it was a horse being trained for the first time. And from this you will, 99% of the time, find the basic maneuver it can't perform. And invariably it will be the stumbling block preventing it from performing the advanced maneuver correctly. Be aware. It might be that there are a number of these basic maneuvers, that it is battling with, and not the first one that you discover. It may be boring doing this, but the pay-off is huge. Back and neck, teeth, feet, saddle fit etc., to make sure you are dealing with a training problem and not a medical one. Go back to using a snaffle cheek piece, with the mouth piece that the horse is comfortable in. Remember that, a snaffle with no lever action, allows you to use one rein with an immediate "pressure on / pressure off release", when the desired reaction is given. This is because there is no pulley action involved. With a pulley action there is a slow release when trying to reward your horse for giving you the desired response. This slow reward for the correct response, means that the horse never learns that it is THAT particular response it is being rewarded for -- because the reward is not instantaneous when it gives that desired response. Work through the basic lessons in sequence, moving on reasonably quickly through the steps it can do well. 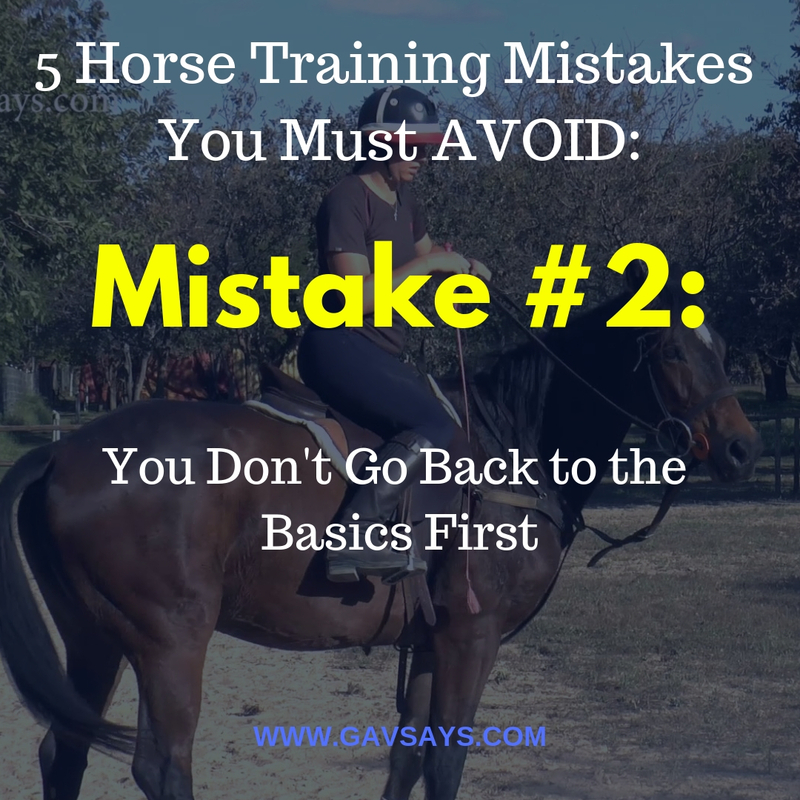 That in the remedial process, you are skipping reasonably quickly through the maneuvers that the horse can perform -- and taking time to re-teach the ones it has forgotten or doesn't know how to do. Where with a young horse, you are taking time to completely teach each lesson in sequence... Taking time over each one before moving on and blending. Go through this process until you find that first maneuver it can't perform, and persevere with that lesson till it is being performed well. Then, move on again, always looking for the next inhibiting factor. Remember though, as you move quickly through these steps/lessons, that even the steps it can perform, might need a quick brush up. "Not Teaching 1 Lesson at a Time / Blending Lessons too Quickly"
So many people rush this process and start blending the lessons they are trying to teach. Instead of just teaching that particular lesson in isolation, before blending it into the general maneuvers the horse is asked to perform when it is being ridden. Remember: One lesson at a time before blending. If you rush this process and gloss over the lesson you are teaching, and pay them lip service as it were, the horse might be able to remember it then and there in the arena. BUT, unless you have persevered for long enough to make it the horses default setting, it will often not do that well out of the schooling environment. Look for all the inhibiting factors, not just the first one you stumble on. Isolate these and teach them individually before blending them. 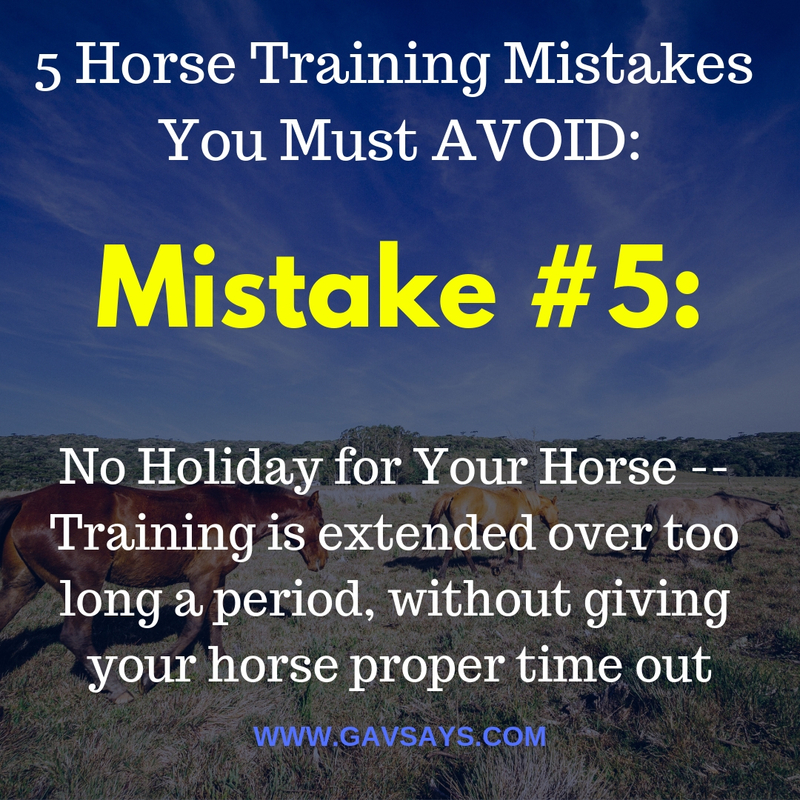 Make sure the horse can perform them easily and well before moving on. Number 1: Is the the horse's work / feed ratio right? This is the most important question I am asking myself as I approach this task. Or because of not having enough energy. Number 2: Is Your Horse Napping? The next thing you need to look at, is whether your horse is comfortable on its own, or is it herd/stable bound and wanting to get back to its mates all the time. If it is stable bound, then you need to teach it some patience and trust, to be comfortable with you and away from the "herd". This is where you use just the one rein, and every time the horse moves unasked and tries to head home (or to its mates), you just bend it and get it moving forwards in a reasonably tight circle. Then only release this rein pressure when the horse stops and stands. When it does stop, you immediately release the pressure. If it moves again unasked, you just keep repeating the process until you have a horse that will stand when asked, and only move when instructed to do so. Number 3: Sensitive to Leg Aids? Or is there no reaction to the leg aids you are giving? The simplest test here is to get the horse to stand still as I have described above, then to apply leg pressure with both heels. It should move out immediately from light pressure. (1) Give the aid while at the same time (2) clucking to the horse with your voice. If it doesn't move immediately, (3) reinforce by tapping with your whip on its rump hard enough to get the reaction you want (different horses are more or less sensitive to the whip, so use it appropriately). You will find that very quickly all you have to do as you cluck is to raise your whip hand, and the horse will react without you having to use the whip. The next step, is to use only the cluck and no whip hand movement. Then you will be able to cull the cluck as well. Now you have a horse sensitive to your legs. The next thing you need to do is to check whether it can do a leg yield to soft pressure from the reins, whilst moving well off your legs. Does the horse know how to give to rein pressure and drop away from the bit? Does it know how to cross its legs appropriately in this gait? 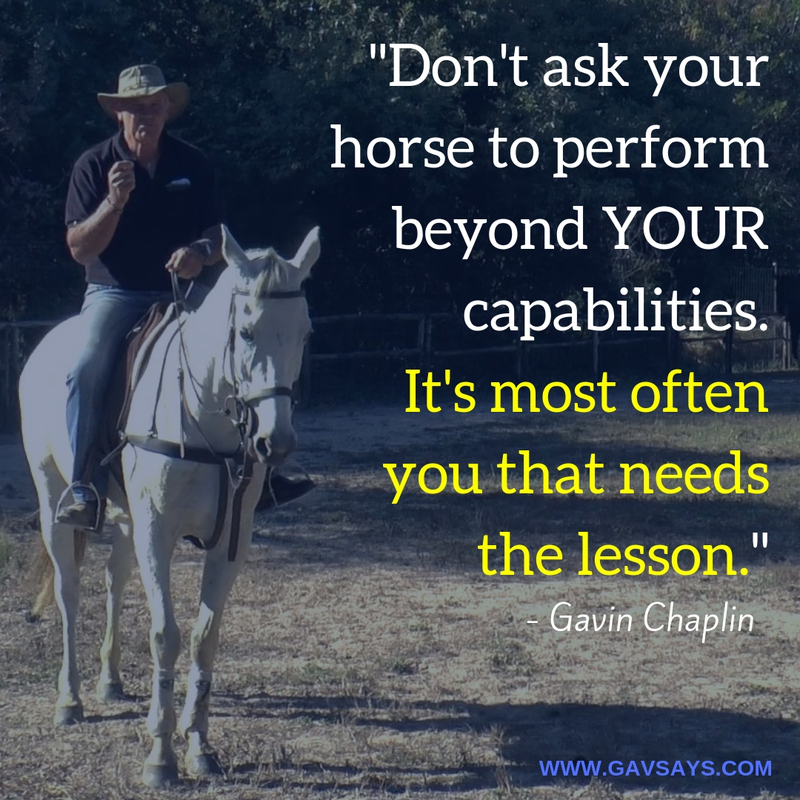 If the horse struggles with the "leg yield" look for the reason and go back and teach the horse what it can't do, that it should be able to do. First start by getting it to stand, then take the pressure on one rein and resist the horse if it resists you. If it gives to that pressure even slightly, reward it immediately by releasing the pressure. Then work back to taking the pressure with your hand closer and closer to your body, until the pull is with your hand slightly across your body. The narrower pull has the effect of getting the flex at the poll and shifting the horses weight distribution onto its hind end. Once you have taught this, move on to taking rein pressure with both hands. Again resisting the horse if it resists you and releasing the pressure the moment the horse flexes and gives to the pressure. Gradually keep the pressure until the horse shifts its weight backwards, then again release pressure immediately. Then only release the pressure when it takes a backward step, and work that up to the horse backing up, ONE STEP AT A TIME. DO NOT GET IT RUSHING BACKWARDS. Apologies for shouting, but that point is important. Always get your horse to back-up in a controlled manner. This is still the basics. Your horse should be able to strike off on the desired lead (both sides) directly from a standstill into a canter. And you should be teaching this before you teach lead changes. Why All the Detail Above? The reason being, is I wanted to show you how thorough you need to be in your approach to finding out what the horse doesn't know. And how painstaking you need to be in teaching/re-teaching all these moves, if you want to be successful at doing effective remedial training. But I won't get into the rest of the lessons, because they will be covered in detail in the "Panic-Free" Horse Training Book I will be releasing soon. For more in-depth training, checkout all our full series' here. 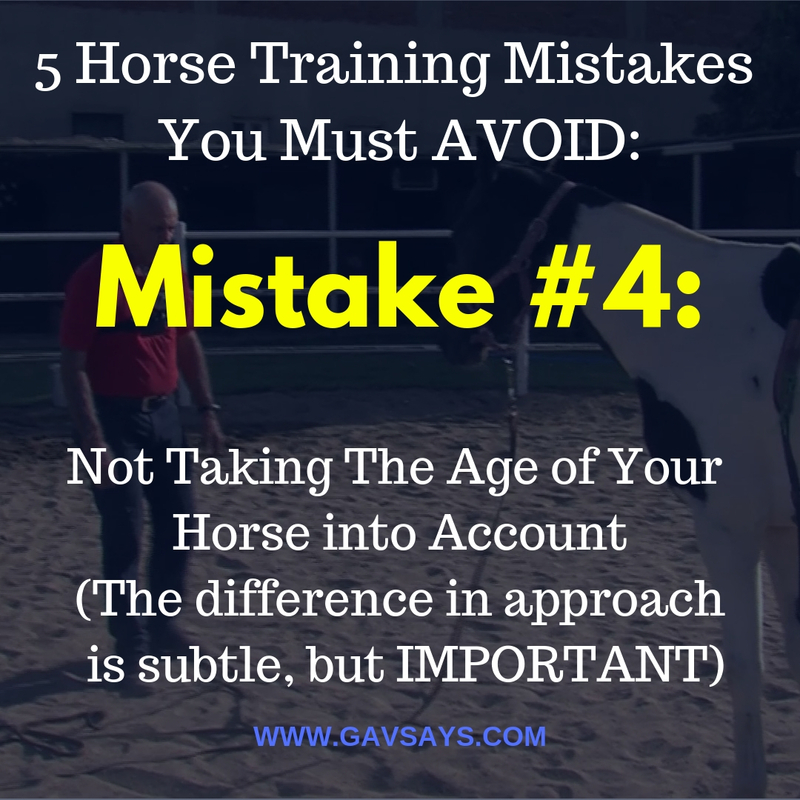 "Not Taking Age of Your Horse into Account"
A younger horse has a much shorter attention span than an older horse. The change in approach is subtle and small, but really important. It's not about you teaching different lessons, or teaching them in a different order. But the change in approach you need to make comes down to the duration of the lesson and the gait or speed you use to teach the horse. A very young horse needs short gentle lessons. An older horse being started can tolerate slightly longer sessions. But just to keep the lesson and training part of the ride, short. So often, a horse's mental state is ignored, and the training is extended over too long a period, without giving the horse proper time out. Think about our children at school. They would learn far less if they were force fed the information without the holidays between. Where they can chill out. Relax. Take a break from this learning stuff. Your horse is just the same. Give it breaks often before it becomes mentally fatigued. You will surprise yourself at the difference that makes. Try to be really aware of this and quit BEFORE it becomes fatigued... Then the breaks you need to give, can be shorter. Hope all these tips help, and that you will be able to avoid these traps and mistakes in the future. Your horse learns the most when you immediately stop doing what you were doing, when it gives you the response you are asking for. This is because in essence, a horse is a sedentary animal (check definition #3) for its own preservation. Because this makes it stay within the confines of the herd, where it is less of a target for predators. Therefore stimulation takes a horse out of its comfort zone. And when you stop stimulating, you put it back into its sedentary mode, and that is its comfort zone. It learns the most when you stop stimulating immediately, once it gives you the desired reaction, because that puts it back into its comfort zone. Make sense now? Great. High fives all round. Cheers and happy "Panic-Free" training.